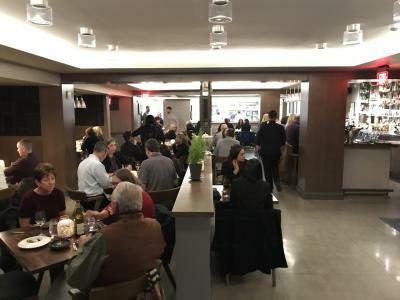 After earning acclaim for their creative small plates, tasting menus, and cocktail program in downtown Delaware, Ohio, Veritas made the move to downtown Columbus in late 2017. The restaurant inhabits two floors of the building at Gay and High streets, previously home to Citizens Bank. 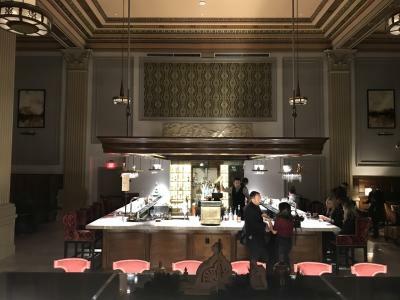 The lower level houses the kitchen and the main dining room, while the upstairs – the old, vaulted-ceiling bank lobby – serves as a spacious cocktail bar. We checked in with Josh Dalton, owner and chef behind both Veritas and 1808 American Bistro in Delaware. NICK DEKKER: How did you become a chef? JOSH DALTON: I grew up right outside of New Orleans, although I never cooked down there. I fell into it, I guess. The industry lends itself to people who don’t have any direction when they’re younger. I started as a server and a bartender, but I just naturally liked the kitchen. It came relatively easy to me – it just made sense. Eventually I didn’t like being told what to do; it seemed easier and easier if I did it myself. I don’t think I’m good at working for other people. As I continued I had my ideas of how things should go or how they shouldn’t. I’m constantly petrified the guys I work with are going to know more than me. We have a competitive nature in the kitchen where we’re trying to be smarter than each other. 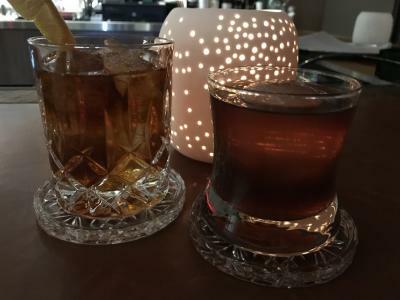 NICK DEKKER: How did you come to own 1808 American Bistro in Delaware? 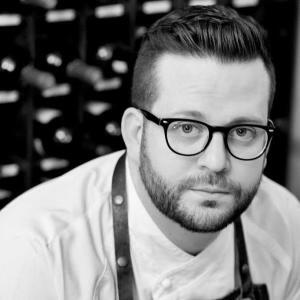 JOSH DALTON: I started at 1808 as an executive chef, then took over as GM, then half ownership, and then I bought my partner out. I’ve been there 10 years and owned it for the last six. NICK DEKKER: What was the inspiration behind Veritas? JOSH DALTON: We thought of Veritas when the space became available in Delaware. I love what we do at 1808, but at the same time it limits what you can do. Veritas was an offshoot of something I wanted to do. We were going to cook food that inspires us and hope and pray everyone likes it. [Ohio State Auditor] David Yost once mentioned the phrase ‘In Vino Veritas’ – ‘In wine is truth.’ The “veritas” stuck with me. We’re trying to convey truthfulness to our food. NICK DEKKER: How did the move to downtown Columbus come about? JOSH DALTON: We opened up Veritas in Delaware and, like, two months later we were looking for spaces in Columbus. It’s something we always wanted to do. The first three years of Veritas were a struggle – we didn’t know who we were and what we were doing. They’ve been instrumental. They were adamant about having us down, which feels good. Somebody thought of our food enough that they wanted us down here. It was scary at first but we’re getting into downtown at the right time. NICK DEKKER: What’s been the response so far in Columbus? JOSH DALTON: I try not to read anything about us. I’m scared I’ll read them and then obsess about them and then that will persuade what we do. We want to keep true to what we do. Most of the articles have been great, but I don’t want that going to our head. Hopefully people are enjoying it and hopefully they are patient. It’s a whole different beast. It took us five years to get going in Delaware, and here we’re learning to crawl all over again. NICK DEKKER: What does the new space allow you to do that you couldn’t do up in Delaware? JOSH DALTON: Everything in the old space made you be ungodly efficient. At the new space we built the kitchen and got the equipment so hopefully we can grow into it and do anything we can dream about. The one thing this kitchen does… it includes every piece of equipment, from a freeze dryer to circulators to a blast freezer. It has allowed us to do anything we like. There’s nothing we can’t do. NICK DEKKER: How do you describe Veritas’ food? JOSH DALTON: I don’t want to pigeonhole us into any specific kind of food. That’s one thing I love about it. If we feel like Mediterranean, we do Mediterranean. If we’re inspired by Japanese dishes or Mexican dishes, we do that. NICK DEKKER: What do you consider your signature dish at Veritas? JOSH DALTON: What’s signature to me and what’s signature to patrons is different. I’m always excited for the new thing. For me it’s the tasting menu that’s constantly evolving. 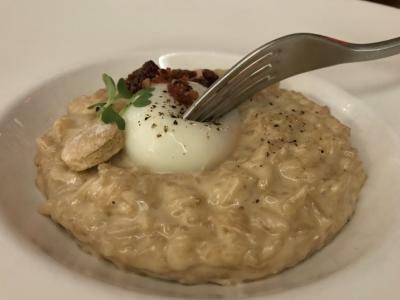 The bacon risotto – if we take it off the menu I know there’d be an uproar. I’m really particular about it. It’s a great dish and if it’s your first time, you should order it – It’s creamy, it’s decadent. NICK DEKKER: What would be your last meal? JOSH DALTON: My mom’s parents were missionaries and she grew up in Lebanon. Her feta dip is on our menu. It would be that with her baba ganoush and her tabbouleh, but she would have to be there.